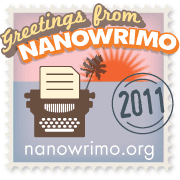 Fruitless Pursuits: All aboard the NaNoWriMo train!! It's November, and aside from epically wonderful moustaches, this month has something additional to offer. 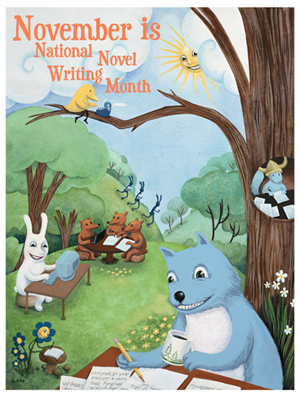 NaNoWriMo (National Novel Writing Month) is a month long, 50 000 word sprint of epic, brainbending proportions. You write a novel in 30 days. "Wha?" I hear you say, "Easy!!" It's really bloody not. It's pretty cruisy initially, sailing through your daily 1667 word limit, feeding off the international adrenalin, but towards the middle of the run? Your interest starts flagging. You start hating what you've done, and finishing becomes a punishing feat of endurance rather than a joyous romp. So why do you do it? Certainly the event has detractors, mainly citing the focus on churning out the wordcount as opposed to quality, but for me the beauty of it is conquering your self doubt. You don't have time to edit, and as a result you also don't have time to second guess, or doubt your gut instinct. You have to go with that immediate idea, and 99% of the time your gut is king. And then when you're done, and you've got a 50 000+ manuscript that admittedly amazingly raw, but complete? It's thrilling. It's a testament to how much we can all get done when we set our minds to it. What did I do in October? Ur, not much. What did I do in September? Pretty much nothing. What did I do in November? WROTE A DAMN NOVEL. There's also a really pleasant international sense of community, of all being in it together, and the event gets bigger with every passing year. It's something I look forward to hugely and this year is no exception. I'll be twittering about it, mostly, so for those on twitter taking part? Follow me (@HogSandwich), I'll follow you, lets do this together. Every single year I think 'Hey! I should do that novel thing!' and then every year I get a week into November and realise it's already far too late. Boo. "What did I do in November? WROTE A DAMN NOVEL." the ability to say that makes this whole thing verrrry appealing. I've tinkered each year. For the past few years, I decided to use it as an opportunity to finish a writing project that's been lingering since 2007. Can I finish it this year, and finally move on to a new project next November? I hope so.